Wilfried Zaha: Is the Crystal Palace winger a target? Does he get enough protection? Wilfried Zaha gets fouled. A lot. The Crystal Palace winger was one of the five most-fouled players in the Premier League last season, and it is a trend that has continued into the new campaign. Mathias Jorgensen’s yellow card-worthy challenge during the Eagles’ 1-0 win at Huddersfield on Saturday appeared to be the final straw for the Ivory Coast international. “I feel like I’d have to get my leg broken for anyone to get a red card,” he said after the match. But is Zaha on the end of more rough treatment than the Premier League’s other star players? And should he get more protection from officials? Zaha has played in four of the Eagles’ five games so far this season and has been fouled 11 times. Only Leicester’s James Maddison, Chelsea’s Eden Hazard and Will Hughes of Watford have been fouled more. Since the start of last season the Crystal Palace man – fouled 87 times – is behind only Richarlison, Hazard, Jordan Ayew and Dele Alli. Rewind even further, to August 2013, and Hazard is the only Premier League player to have been stopped unlawfully more times than Zaha. Why is Zaha fouled so much? It is no surprise the most-fouled players also tend to be among the most dangerous in attacking positions. Hazard, for example, scored a hat-trick in Chelsea’s 4-1 win over Cardiff on Saturday and has been directly involved in more goals than any other midfielder in the league since his debut for the Blues in 2012 – scoring 74 and assisting 41. Zaha has also carried his prolific form from last year into this season, with Saturday’s goal his third in four games and eighth in his past 10 league matches. 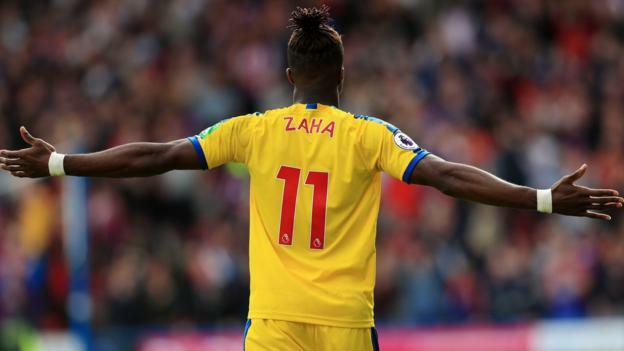 The Eagles have come to rely on him, averaging 1.5 points per game in the 33 matches Zaha has played since the beginning of 2017-18, compared with zero in the 10 he has missed. Former Premier League midfielder Robbie Savage says that makes him a target, and admits he would “try to wind up” similar opponents during his playing days. “I would think, ‘I’m going to try to get in their face, I’m going to niggle, I’m going to kick them’. I knew my job in the side,” Savage told BBC Radio 5 live. Is rough treatment getting to Zaha? The most-fouled players in the top flight generally tend to be those who attempt the most dribbles – Hazard, Zaha and Manchester City forward Raheem Sterling are the three most-fouled players of the past five seasons and also the most prolific dribblers. But Zaha said after the Huddersfield match that being singled out for rough treatment “makes you not want to go on a run because someone will come through the back of you, and it doesn’t allow you to express yourself”. We are obviously still early in the new season but Zaha is – on average – attempting almost half as many dribbles per match and is being fouled slightly more often. Does he get enough protection? Zaha’s frustration came out on the pitch on Saturday – two minutes after being brought down by Jorgensen, he fouled Florent Hadergjonaj and was shown a yellow card. This season, three of the 11 fouls on Zaha have led to a booking for the tackler, compared with six bookings dished out for fouls on Hazard and Bournemouth’s Ryan Fraser. Last season, only Richarlison got more opponents carded for fouls, and since 2013 Hazard is the only player to top Zaha. But Palace boss Roy Hodgson believes not only do players not get booked for fouls on the winger, they do not get penalised at all. “There were quite a few occasions [at Huddersfield] that if those fouls were at other end on one or two of their star players there might have been a chance of getting a free-kick,” Hodgson told BBC Radio 5 live. Kevin Kilbane, who played as both a full-back and a winger in his career, says the kind of treatment Zaha receives is nothing new. “I played against many full-backs who would do anything they could to stop you when I was a kid coming through the system,” said the former Republic of Ireland international. Former Everton midfielder Leon Osman believes Zaha responded in the best way possible to being targeted at Huddersfield. “Because he is so important, he is going to be on the end of kicks every single week because opposition teams will think, ‘we stop him, we stop Palace’,” Osman told BBC Sport. Are referees more lenient on Zaha’s opponents? Former England boss Hodgson suggested his star man is not getting the benefit of the doubt because of “media campaigns and experts making their judgements”. Zaha, who has been booked for simulation four times in the past three seasons – more than any other player, has previously said he feels opponents “want to get me banned” for diving. “The campaign that has been mounted against Wilf is having an influence and that is sad if it is the case,” said Hodgson. Osman says Zaha has a tendency to hold on to the ball too long, but can understand the winger’s frustration after being on the end of what he describes as potentially “career-ending” tackles. “I do feel he goes down a bit soft. I also feel he holds on to the ball a little bit too long at times and allows himself to be kicked,” Osman told BBC Sport. “However, the two tackles he has been on the end of in the past two games have been career-ending, both of them. “So I can understand his frustration. Neither of them have seen a red card, so you can see why he is wondering where the protection is. Kilbane says a player of Zaha’s quality will continue to be targeted, in the same way Lionel Messi is at Barcelona, Gareth Bale is at Real Madrid and Hazard is at Chelsea. “He is a supremely talented footballer. He is going to get riled. We will see more of what we saw on Saturday,” said Kilbane. Next articleIs Ethiopia on a path to inclusive democracy?